Snowy, Icy - Snowy at the very top and couple miles downhill. This is an all day enduro-style loop that will be sure to test your legs and lungs! Overall, it comes in at almost 26 miles and 5,000' of elevation! Don't ride a couple of days after the rain. From the Tucker Wildlife Sanctuary at the end of Modjeska Canyon Rd., head around the gate and start climbing. If you weren't awake yet, you'll be quickly as the first mile gains ~510 feet before a short 0.25-mile downhill. The downhill is over quickly, and you start climbing again. The Harding Truck Trail lives up to its name—it's hard. It's a truck trail / fire road the whole way up. Although wide, it does have more of a double or even singletrack feel than most OC fire roads. One side will be more dominant than the other. Unlike Maple Springs Rd (the most common way to reach 4 Corners), you'll not experience vehicle traffic on Harding unless there is an event scheduled that day. It's a popular trail running route. The trail will also stay hard-packed throughout the year and holds up against rain fairly well other than the first two miles. It's definitely more challenging though. At the 7-mile mark, you'll get a much-appreciated reprieve from the average eight-plus percent climbing for about 0.75 miles before the last 1.5 mile charge up to 4 Corners. From 4 Corners, you can head down to Maple Springs and road-ride back to your car, head up to Modjeska, Santiago Peaks, Joplin Trail, Silverado Motorway, or simply back down Harding. 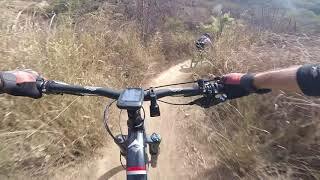 Joplin is a technical-trail-lovers kind of trail located at the top of the Santa Ana Mountains. It starts at the saddle of Modjeska and Santiago Peaks and drops down the west slope of the mountains to an area called Old Camp. Drops is a good word to describe this trail as it sheds off nearly 2,000 feet of elevation in about two miles. The trail is often loose and rocky with some chunky stuff here and there. Combined with an average grade of 20 percent, this is one of those places where you need to bring your "A" game to fully appreciate this trail. You just can't drive to either the bottom or the top of the trail so it requires some work to access it. The route described here is a combination of the Harding Truck Trail, Main Divide Rd, Joplin Trail, and the Santiago Truck Trail. It is a little over 25 miles long with just over 5,000 feet of climbing. Joplin alone would be considered an advanced level trail, but combined with the cardio effort required to get to the trail, I feel confident in calling this loop an advanced ride. 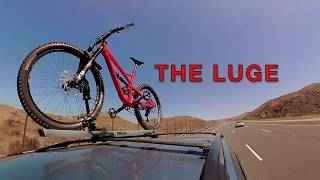 While Joplin can be ridden on any type of bike (skill level dependent of course) I think most people would find the price of admission to lug a bigger travel "All-Mountain" style bike up the mountain worth it. Once on dirt, this ride is one of the good ones. 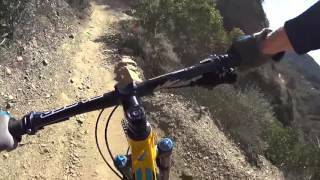 The climb is a rocky doubletrack with crazy good views of the OC and sunsets. The descent is a steep, twisting, cliff-exposed singletrack, more like a carved half-pipe, that snakes to the final paved downhill. Yes, there's a good amount of riding on pavement, but at least some of it is 40mph downhill... er... huh-hum... actually officer, I was going the speed limit of 35 mph, I swear. 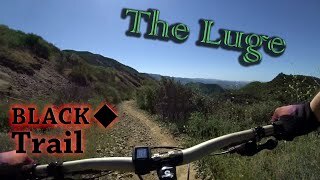 The Luge x Whiting Loop Trail Guide. Election Day at the Flags! Near Laurel Springs on Harding TT. First time on the Luge was a great ride. Out riding The Luge on a demo day!